Announcement Handmade jewelry from Santa Barbara, California consisting of quality necklaces, earrings, bracelets, rings and pendants using mixed metals such as Sterling Silver and Copper, 14K Gold fill and Brass. I use Abalone shell, genuine Pearls, genuine Turquoise, Sea Glass and genuine gemstones in all my work. Please feel free to contact me as I welcome custom orders and custom requests. 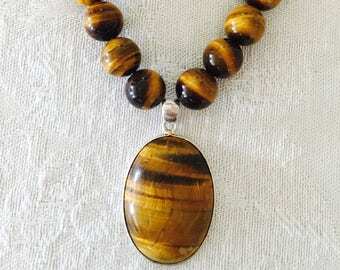 Handmade jewelry from Santa Barbara, California consisting of quality necklaces, earrings, bracelets, rings and pendants using mixed metals such as Sterling Silver and Copper, 14K Gold fill and Brass. 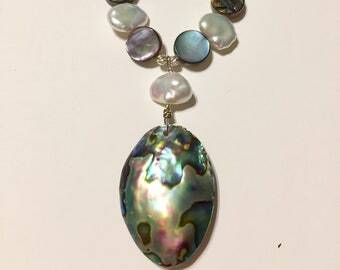 I use Abalone shell, genuine Pearls, genuine Turquoise, Sea Glass and genuine gemstones in all my work. Please feel free to contact me as I welcome custom orders and custom requests. They are very Big pearls very nice! I have a weakness for hearts and this is one that I had not been before. Nice quality and quickness of delivery. The earrings did not match sizewise. They are oxidized and have marks on them. They are literally a wire. Labradorite Gemstones - Such a magical and mysterious stone - One of my favorites! 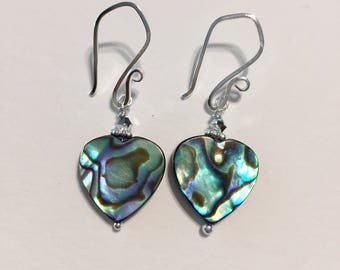 Based in Santa Barbara, California very close to the beach, Eleven13 is a handmade jewelry line featuring a variety of gemstone jewelry, mixed metal jewelry, genuine Pearl and Abalone jewelry. 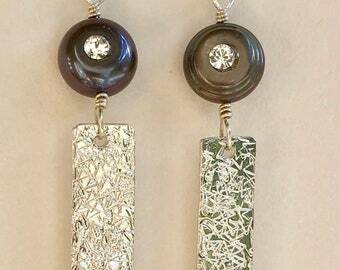 Eleven13 jewelry only uses Sterling Silver, 14k Gold filled metal, Copper and Brass. Most of my jewelry collection is one of a kind and unique but I am happy to do what I can to fulfill your custom orders. I originally found my passion for handmade jewelry about 25 years ago when I started making beaded belly chains, anklets and necklaces to wear to and at the beach. I sold my beaded jewelry to friends and at a local business in the Bay Area. For some reason I stopped making beaded jewelry and went about my life, moving on with marriage, family and work. After my children, I once again found my passion for creating. This time it was sparkly children's room letters, plaques and sayings using Swarovski crystals. I have always had a thing for shiny, sparkly things. With this latest venture I discovered my old passion for jewelry. About 5 years ago I opened an Etsy shop and haven't turned back since! 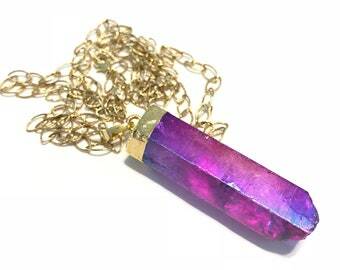 I still love shiny and sparkly but try to create a range of jewelry items to satisfy different types of people. Creating jewelry pieces gives me inner peace, I love the feeling I get from different gemstones and to see my designs come to life and their new owners enjoy them. I am mostly self taught but have taken a few local Soldering classes which I adore! I really enjoy making mixed metal jewelry. You will find a variety of handmade jewelry pieces in my shop. I hope you will find one that speaks to you. Returns Accepted! I want you to be satisfied with your Handmade Jewelry purchase. I will offer a full refund if returned within 7 DAYS of receipt (buyer pays return shipping, including insurance and any paypal fees). Refund will be issued once the item has been received unworn and in orginal state and packaging. In the rare event that items might have been damaged during shipping, please contact me and I will have you return the item with either a refund or (if possible) a replacement item. Paypal accepted which includes Credit Cards. Direct checkout with Credit Cards accepted right in my Etsy shop. Did you know? You do not need a PAYPAL account to use it? You can use them simply to safely process your credit card. Custom Orders require payment at time of order. All orders will be shipped within 1 day or sooner via USPS First Class Mail with insurance and tracking.